"There are just two bequests we can hope to give our children. One is roots, the other wings." and challenged the students there to not only go out to do great things, but to build great relationships remembering always that they each have the ability to touch a life every day. The world will never be the same again because of that. 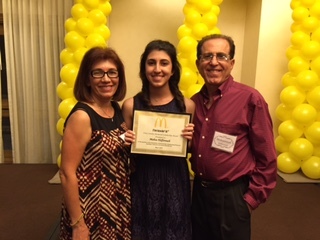 Erin Scholarship awarded by RMHC and Central Texas McDonalds owners. Debbie and Kevin attended the RMHC and McDonalds owners' award dinner the night of May 14, 2013. See the home page for picture. Twenty-five other $1000 scholarships were given to area Seniors. Rini received $4000 from the Erin Crowley Scholarship. Debbie shared the following words with all the RMHC scholars and their families that night at the dinner. Thank you to McDonald's restaurant owner - operators and RMHC for the honor bestowed in Erin’s memory. Thank you for this opportunity to speak and to help present the scholarship that bears her name. My son Kevin joins me tonight for this special annual occasion for our family. Congratulations to all of you. I am honored to get to know a little about you and to be here with you and your families tonight. You are all winners. Your resumes are impressive; your future is bright; you have so much to give! You are WOW kids! For that you should be proud. I know your parents are proud of you. My daughter Erin was a Wow kid too. She was perched on the edge of a fantastic future, just like you. The whole world was before her, but her future turned out a little differently. I mention this not to make you sad but instead to share what has become to me a lesson of inspiration - one that I learned with Erin's help – while she was alive AND after her death - and one that I hope you will carry away with you tonight. You’ve heard that Erin was a recipient of a similar scholar’s award in 2007. For 5 years she had been fighting a brain tumor. She had surgery, chemotherapy, two relapses, an autologous stem cell transplant and she lost her hair three times. But throughout Erin's fight with cancer amazingly we experienced many blessings. That may be hard to believe but it was so true. And perhaps the biggest blessing was how Erin and her story touched so many people in the five years she lived it and now through this wonderful scholarship bearing her name. On Erin's monument we had these words etched in stone "she touched us all". I share this with you so you will know that in all your accomplishments both past, present and yet to come; in all your awards; in all your community service, everyday meetings, in work, in play, and even in sorrow never forget the power you will have to touch and influence all those around you. The connections you will make will be what people will remember about you. You may be the life line for some despairing person or the voice who gives reassurance and guidance to a friend who needs it. You have the ability to be all of that and more to others. So as I love to hear of all your accomplishments, don’t forget the people around you and your effect on them. We all have a place in the world to fill, but we won’t fill it alone. We are all together. Congratulations again to all of you and especially to the winner of the 2013 Erin Crowley Scholarship, Rini Sinha. Spring used to be my favorite season: new life, flowers, warmer weather. I still do appreciate these things but now spring has an additional meaning to me: anniversaries. Now when March comes I remember the day Erin came home from the hospital to be enrolled in Hospice care. That was on my birthday. I recall the night we helped her get dressed up for Prom because her friends were honoring her as Prom Queen. I recall a party at Dave and Buster’s with about 25 of Erin’s closest friends who came to celebrate her life….not her impending death. I remember the last trip to Dr. Sharp’s office to draw blood. Looking back, I don’t know why we kept up with those rituals…maybe we were trying for some kind of normalcy, schedule, and routine at the end. Erin, who was always so brave and matter of fact cried when Jennifer had trouble finding a good vein. Our hearts broke and so did Jennifer’s. And of course April 25th will always be Erin’s Angel day, the day she left her life here and passed into eternal life. I understand that better some days than others. Maybe that is why God brought Erin home right after Easter so that I would always make that connection…so that through the Easter story I would always have faith in the Promise of our own Resurrection. There is nothing else that can comfort a parent who has lost a child any more than that. I know she will live on in paradise. Nothing else matters than the promise of new life. Nothing else matters. So spring now means so much more than just blooming flowers, butterflies, bright sunshine. I see Erin in all of those things. She is with me in so many small and large ways reminding me that now she is part of that new life also and I smile instead of cry! Thank you all for your continued prayers. We will never be “over” Erin’s death, but we are at peace with it. The sadness of her absence can wrap its cold arms around us at any moment of any day, with a song, a place, a face, or even a small hand. Her life and death make us who we are today….but, hopefully, we are better for it, because she made us that way! I thank God for the gift of Erin’s life. I hope I can honor her with mine. “Come to Me all you who labor and are burdened and I will give you rest… For my yoke is easy, and my burden light." 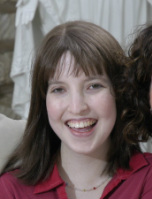 This year marks the 5th anniversary of Erin’s death and the beginning of her foundation. Your past support has helped to continue the good works of Dell Children’s Medical Center, the Ronald McDonald House, and the scholarship fund of St. Michael’s Academy. Your generosity has helped to build a strong fund from which to benefit these worthy causes. We thank you for helping to keep Erin’s name and memory a part of a worthwhile endeavor. _ As we end 2011 and begin a new year I look back to our special family celebration taking place on Erin’s Angel Day, April 25, 2011. We were fortunate to have all our immediately family together in St. Louis for Easter. We flew from Austin and Kevin and Catherine came from California. We gathered at Megan, Jeremy, and Colin’s home in Rock Hill to celebrate this important Holy Day. But it was especially important this year because it occurred just the day before Erin’s Angel Day! 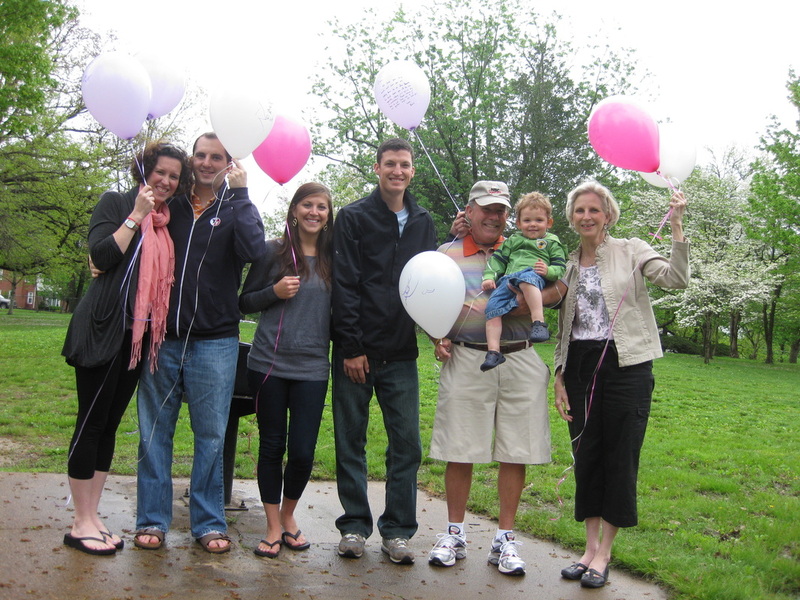 To honor and remember her, we bought pink and white balloons on Monday to release at Tilles Park near Megan’s home. We gathered in the late morning with our balloons and each of us shared a personal memory of Erin, wrote a message to her on our balloons (even 20 month old Colin! ), and then released them carrying our messages to her on that rainy day. It was an especially meaningful day to us and the photo we took is shared with you on this website. It is not often we are all together at the same time and place but Erin brought us together that day! We love you Erin and think of you every single day! You are our daughter, our sister, our Aunt, our friend, our hero, and we love you more today than ever! On May 14 Tim and I were blessed to be invited to the 4th presentation of the Erin Crowley Scholarship given away each year now to a Central Texas senior who is on the way to college. The Ronald McDonald House Charities with the Central Texas Co-op of McDonald’s Restaurant Owners fund and sponsor this new scholarship initiated in 2008 in honor of Erin who was a recipient of one of their 25 Scholar Awards in 2007, the year she passed away. The organization was so impressed with her story and life that they created this special $4,000 scholarship in her memory. Each year since 2008, the inaugural year, we are invited to the award dinner to present the scholarship. This year Erin Green (can you believe it!) was awarded the scholarship. It was an amazing coincidence that she has the same name as Erin. All applicants receive numbers for the reviewing process. It gave me goose bumps to know her name was Erin. She is such a sweet girl; a senior from Bowie high school in Austin and she wants to be a teacher. She will attend UT Austin in the fall. Tim and I were honored to be there. We were invited to speak briefly and used the opportunity to impress upon the young people there that whatever they strive for in life that they should always remember the importance of family. Their lives will influence and touch many so they should also live with that in mind. Every day will provide an opportunity for them to make an impression with all whom they come in contact; often in ways they will never know. These lessons we have learned through Erin and how she did just that during her short life and illness. We stayed afterwards at the bar outside at the Hyatt and had a drink in Erin’s honor and enjoyed recalling family stories and gazing at the beautiful skyline as the sun set. We both felt Erin was there with us once again. P.S. 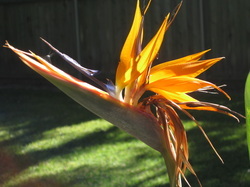 Erin’s Bird of Paradise is still living and making new leaves!! I am thrilled!! We hope this Easter season was joyful for you and yours. It is unfathomable that Erin left us four years ago as she graduated high school. We wish we could be celebrating her college graduation as well, but God had other plans for her. Through your generosity we have kept her spirit alive by supporting Ronald McDonald House, Dell Children’s Hospital and St. Michael’s Academy. All of these were so meaningful to her in her short time with us and we are honored to continue the work she started. We sincerely appreciate your past contributions and ask for your continued support. And start another day without you in it. And the way your eyes twinkled with mischief and secret knowledge. To honor you, I take the time to appreciate everyone I love. I know now there is no guarantee of days or hours spent in their presence. And sing at the top of my lungs, with the windows rolled down. Risk making a fool of myself, dance every dance. You were my light, my heart, my gift of love from the very highest source. So every day, I vow to make a difference, share a smile, live, laugh and love. When I was pregnant with Erin in July of 1988 (she was born on September 13, 1988) Tim and I went to a convention in Hawaii. I wanted to bring back something lasting as a souvenir so I chose a small pre-packaged flower bulb of a Bird of Paradise to plant when I got home. Erin was born 2 months later and over time I began to refer to the plant as Erin’s plant. Megan and Kevin also had their own different plants given on or around the years they were born. Their plants eventually died after many years. 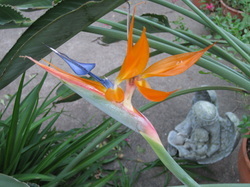 But Erin’s Bird of Paradise thrived. The only problem is that it NEVER bloomed despite the fact that it grew larger each year. But on September 16, 2009, three days after what would have been Erin’s 21st birthday and after 21 years of dormancy, it bloomed for the first time! There were four beautiful orange flowers. Of course we feel Erin’s (and God’s) hand in this. What a gift we were given. The blooms lasted well into the winter until the first freeze. Thinking this may have been only a once in a lifetime occurrence, I didn’t hold out much hope of another fall blooming. But Erin had other plans. 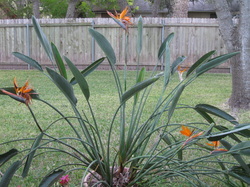 In September of 2010, a year later, it bloomed again and this time added an additionally bloom – five this time! We enjoyed them so much and took so many pictures. We have posted some of the photos at this site. Who would have imagined the significance of returning from Hawaii 21 years ago with a Bird of Paradise and what that would come to mean to our family today! We truly do have a Bird of Paradise in Erin! The winter of 2010-2011 was harsher than usual with many freezing nights. We covered and uncovered the flower many nights but it sustained considerable damage from the cold. This spring I split the plant and repotted it. We don’t know what will happen this fall, but we hope and pray that this special outward sign of our sweet Bird in Paradise, Erin, will bloom again one day! Though our hearts are always missing you, we are filled with so many memories of your beautiful spirit. You showed us just how special is God's precious gift of life. 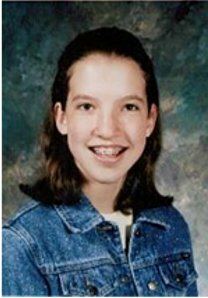 *This is Erin's 7th grade picture taken in 2001. Erin's family uses this space to keep in touch. Check back often for updates.